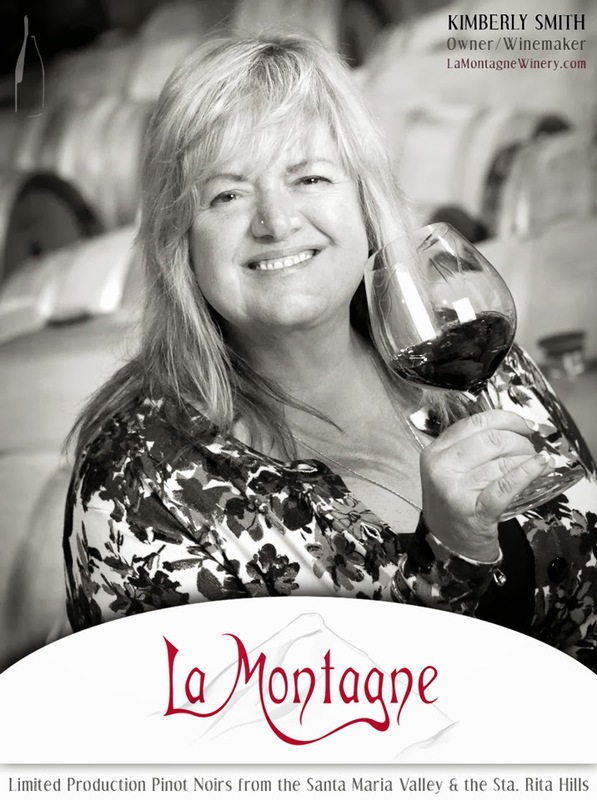 Back in September 2013, JD and I were happy to meet LaMontagne Winery owner and winemaker, Kimberly Smith. I wrote a short blurb about her delicious wines, and hoped that we would find ourselves tasting them again soon. We were able to make that happen during a short trip to the Central Coast in December. We headed into the Lompoc Wine Ghetto on a surprisingly warm December day, where Kimberly opened her tasting room exclusively for us! The first thing you need to know about Kimberly is that she is driven to make things happen. When she wondered why she loved Pinot Noir so much, she went back to college to find out what it was about that grape that made her happy. The class changed her life. That was the night she met winemaker, teacher, writer, activist, and all-around Renaissance man, Wes Hagen of Clos Pepe Estate. She knew right away that he was the guy who had the answers. She asked him to mentor her, and the next morning she was in the vineyard! Her first vintage went into barrel in 2010. It was from the Clos Pepe Vineyard. For those of you who may remember, 2010 was a small, but great vintage. She impatiently kept her first vintage in barrel for 18 months, and it was worth the wait. She's increasing her production little by little every year. Kimberly also produces Pinot Noir from Sta. Rita Hills as well as a Pinot Blanc and a Tempranillo. 2011 Pinot Blanc, Sierra Madre, Santa Barbara County AVA - Sandy-loam soils, cool growing conditions. A wine with low alcohol and bright acidity. Stainless steel. Alc. 12.8%. Only 50 cases made. 2012 Pinot Blanc, Sierra Madre, Santa Barbara County AVA - Sandy-loam soils, cool growing conditions with cold Pacific air blanketing the vineyard by afternoon. Allowed an extended hang-time for ripening. This wine has vibrant fruit character with crisp acidity. Stainless steel. Alcohol 13%. 75 cases. My original tasting notes on this simply say "Yum!" 2011 Pinot Noir, Huber Vineyard, Sta. Rita Hills AVA, Clone 115 - From one of the oldest vineyard in Sta. Rita Hills (1987). 18 Months in barrel, 50 percent new oak. Dark cherry fruit, spicy aromas, food friendly acidity. Alc. 13.9%. 50 cases. We loved this wine, and bought a bunch of it. 2011 Pinot Noir, Sierra Madre, Santa Barbara County AVA, Clone 667 - Sandy soils, Pacific Ocean breezes and fog. Originally planted in 1971. 18 Months in barrel, 50 percent new oak. Deep red cherry with toasty plum aromas, spice with earth and oak notes. Good structure and balance! Alc. 13.9%. 75 cases. 2011 Tempranillo, Bella Collina Vineyard, Paso Robles AVA - Cooler West side of Paso Robles is the home of this vineyard. Single designate (Not a blend). 18 months in barrel; combination of Hungarian and French oak. Fruit-forward dark berry with toasty spices. Good acidity with a backbone of supple tannins. Alc. 13.9%. 100 cases. JD and I spent a delightful couple of hours getting to know Kimberly and her luscious wines. I am looking forward to her new vintages with great anticipation!